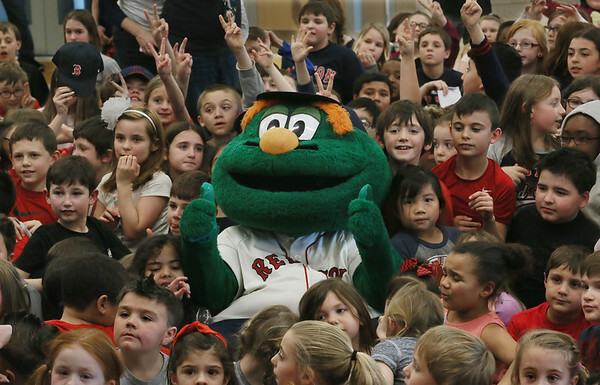 Students gather around Wally the Green Monster, official mascot of the Boston Redsox, following his performance at an all-school assembly Friday at West Parish Elementary School in Gloucester. Wally's visit to the school was a reward for the students having reached their goal of reading 1,500 books in March. (They actually read 1,648.) The mascot was accompanied by "Big League Brian" Dwyer of Medford, who performs on stilts during Red Sox Games. Dwyer read stories to the children while Wally acted them out.